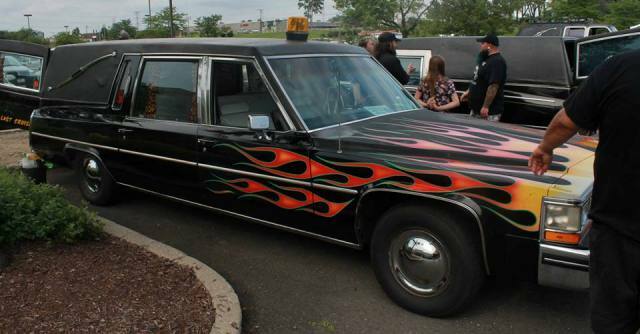 The 2015 Hearse Show was quite a ride! 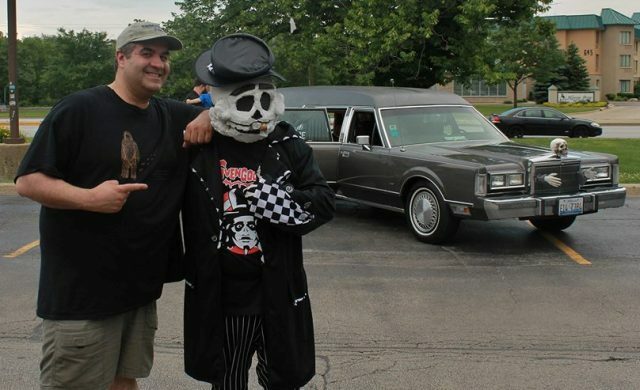 On Saturday June 13th I headed up to Lombard, Illinois to attend a Hearse Show. 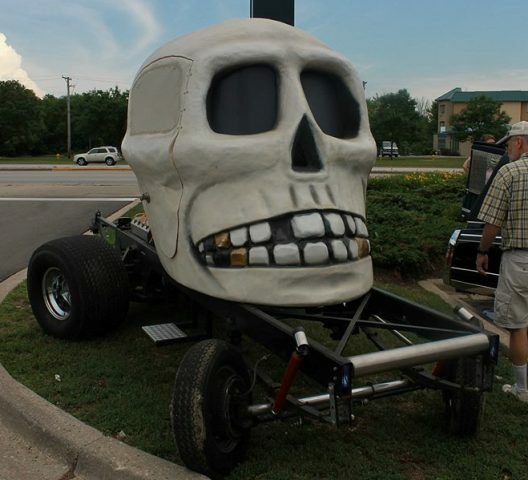 Not only did the event promise a collection of automobiles specifically designed to deliver you to your final destination but also live music and a visit from national horror host Svengoolie. 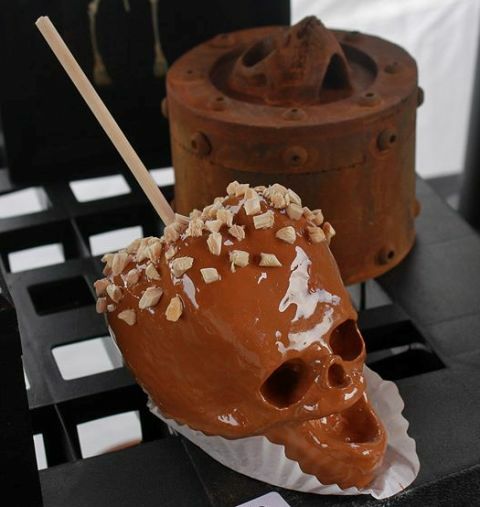 As someone who firmly believes that Halloween is much more a state of mind rather than just a date on the calendar, an occasion such as this was just too darn fun to pass up! Joining me for the ride was my friend, Susan, a gal who also enjoys the macabre. I arrived at 5pm and the festivities were already well underway. I parked my car; a red Toyota RAV-4 which, in contrast with today’s featured vehicles, may as well have been the Partridge Family Bus. 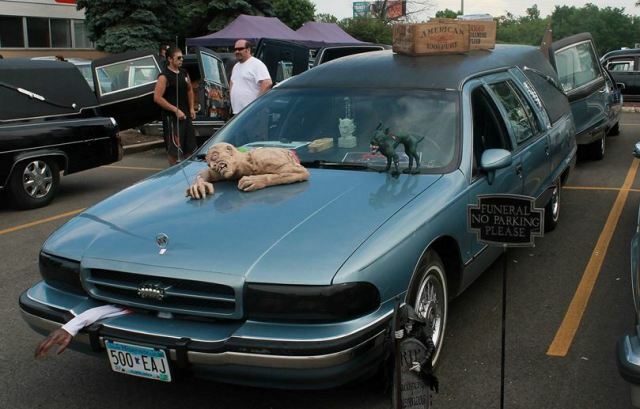 Before reaching the bulk of the hearses, I encountered a collection of vendors selling some pretty neat hand-crafted items. 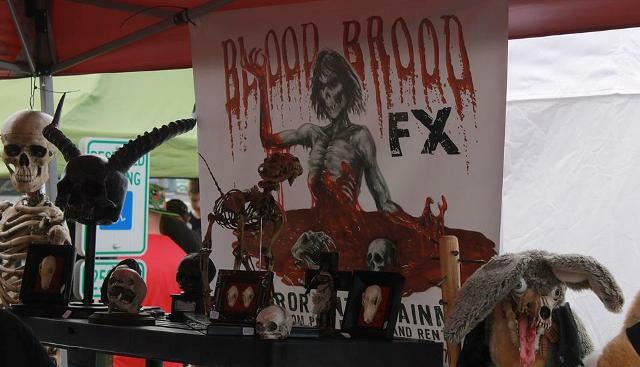 I was especially pleased to see one of my favorites, Blood Brood FX. 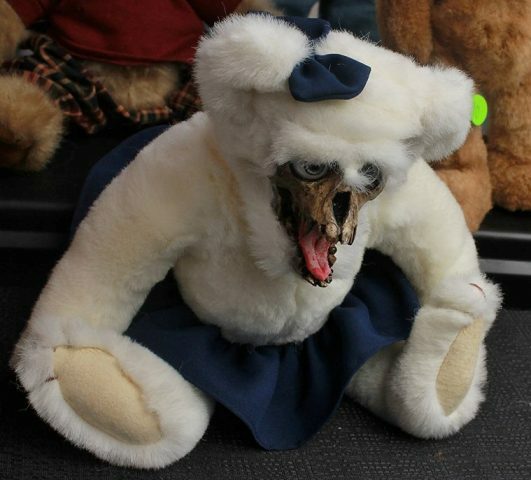 For the past several years I’ve encountered a number of artisans specializing in unique monstrosities; creatively meshing stuffed animals with blood, eyeballs, and skulls. Blood Brood FX was one of the first and best! 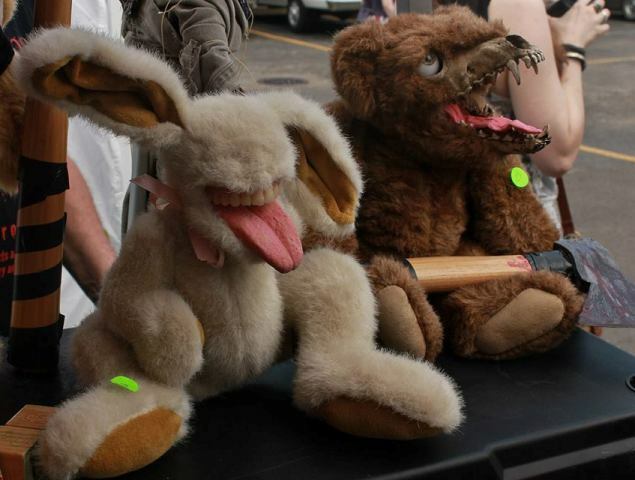 I absolutely love their homespun horrors and you can’t walk away from their booth without grinning (unless you aren’t a horror fan in which case you’ll run screaming). I’d purchased from them before at Flashback Weekend and love how every time I see their displays it’s chock full of fresh new items. 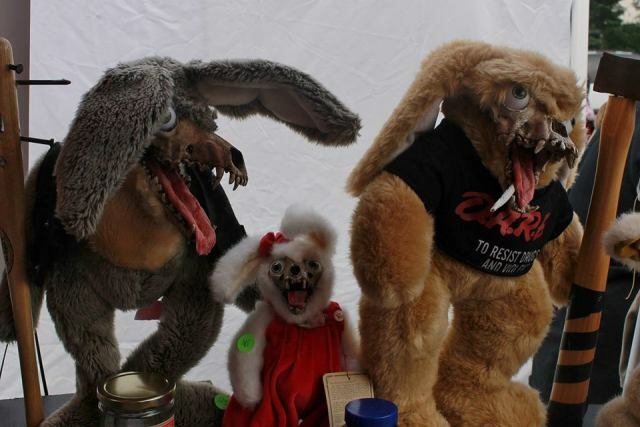 This year my favorites included an eyeless rabbit with a human mouth and a couple of skull/spider concoctions I couldn’t help but imagine sitting on my shelf next to my live tarantulas (currently small spiderlings but destined for greatness). I’ve always had a thing for evil toys and had just watched one of my favorite killer doll film, DOLLS, the previous weekend. Unfortunately, I wasn’t aware they’d be here and only brought $30 cash. Dammit why couldn’t this have been the weekend after payday!? 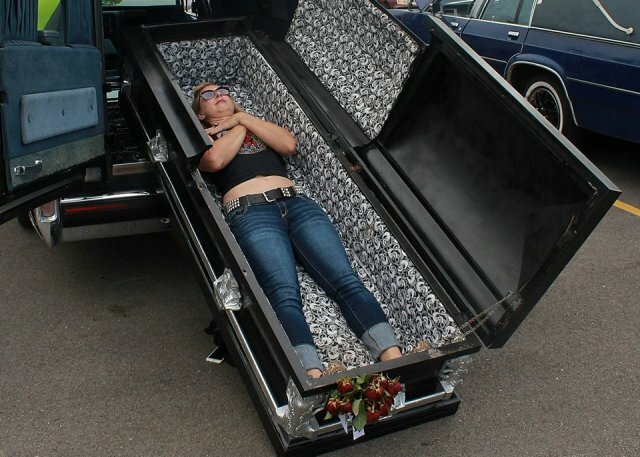 After Susan arrived we checked out the hearses and one of the first ones featured an open casket hanging outside of it. I jokingly asked Susan if she wouldn’t mind posing in it for a picture and, without skipping a beat, she jumped right in. 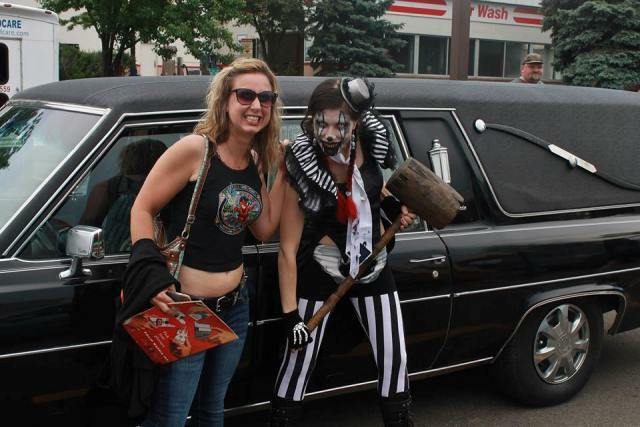 This is definitely the kind of person you want to take to horror events…someone who doesn’t mind hamming it up and having a good time! We saw the line to see Svengoolie which was quite long despite the event charging to see him. 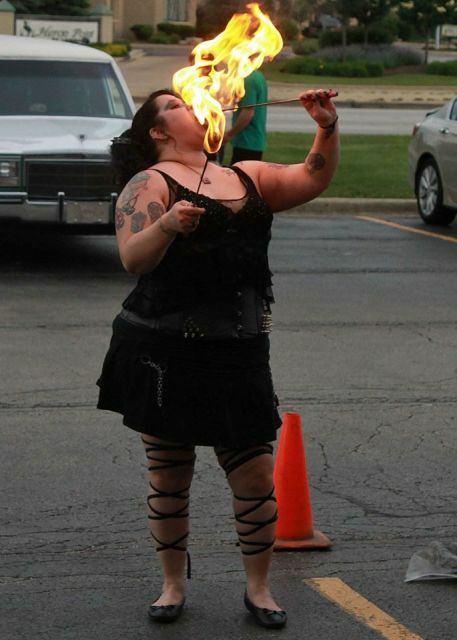 We took our spots while getting some free entertainment courtesy of a woman eating fire! It wasn’t an illusion as her tongue had a noticeable black spot and, while I’d seen stuff like this at the circus or on TV, I’d never witnessed it so close up and it fascinated me. “I think its mind over matter,” said Susan. “I’d love to learn how to do it!” As she’s affiliated with the Eastern Groove Studio; a belly dancing and holistic movement group in Elgin, I had no doubt that one day she will. Next we came across a guy wearing a paper Mache’ skeleton mask and Svengoolie shirt. I took a picture with him and was given his business card which said BAGGO Bones along with a phone number should I want to hire him to host an event. It was the first time I’d seen him and wondered if he was a new public access TV horror host. Back when we used to do our weekly Horror Host Reports, it was like having Professor Xavier’s “Cerebro” when it came to detecting new ones but now we’re not so on top of things. 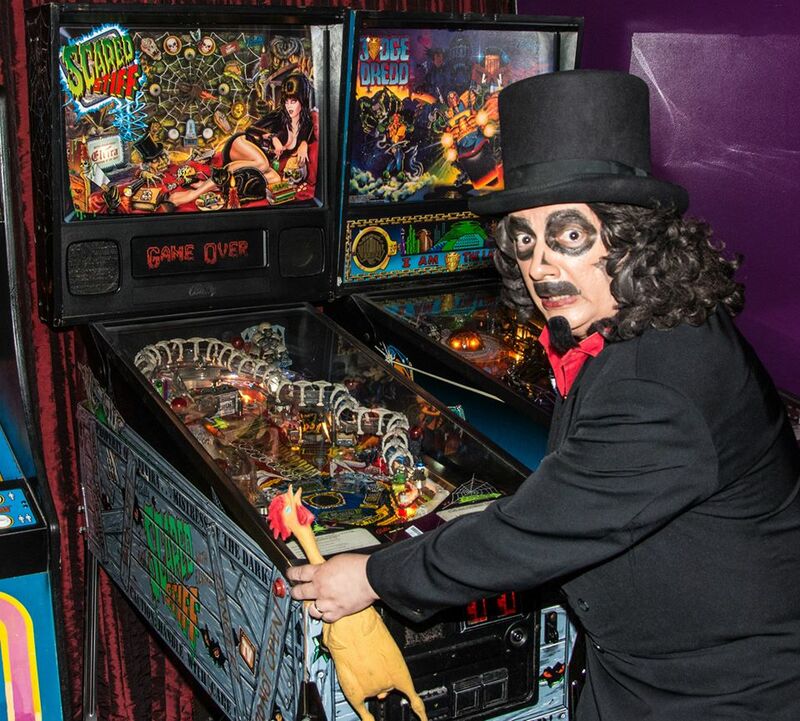 When we finally made it into the building where Svengoolie was signing autographs, we discovered it was a game room with billiard tables and KISS and Elvira pinball machines. “Oh we gotta get a picture of Svengoolie in front of that!” I said, pointing to the one featuring the Mistress of the Dark. Later Sven would get a shot in front of it, courtesy of Jim Roche (and seen below)! Then it was our turn to say hello to Svengoolie!!! 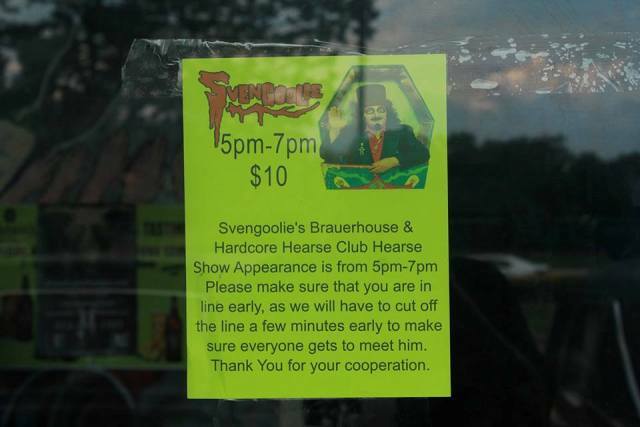 After we left there was a small group of people gathered out front who asked whether or not Svengoolie would be exiting the same door. Apparently they were hoping to get a glimpse of him despite no longer being able to do so formally due to the line having to be cut (remember folks, when attending a Svengoolie appearance, the early worm gets the rubber chicken!). 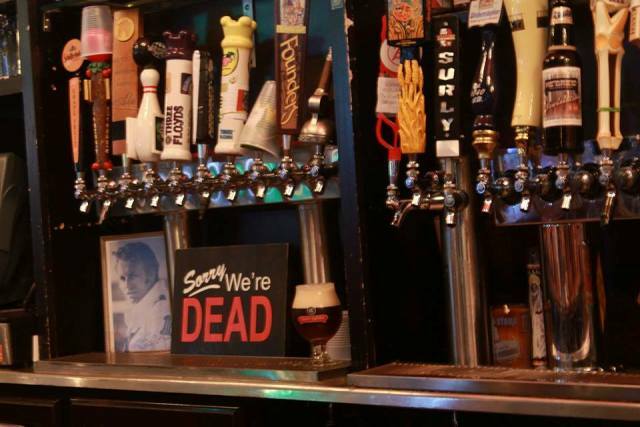 We headed around the corner to the Brauerhouse which was one of the most interesting bars I’ve ever been in. While entering I bumped into Curtis Meyer, a.k.a. 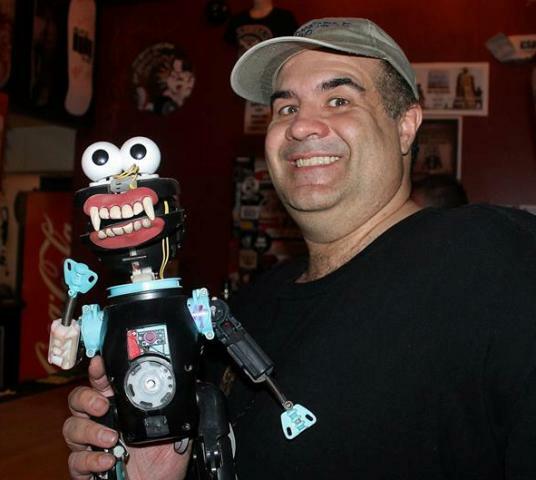 Wisconsin PA host, Deadgar Winters, from “Deadgar’s Dark Coffin Classics.” He gave us some swag from his show and told us he’s now being aired on Chattanooga, Tennessee public assccess too. I told him we Daves had just visited Chattanooga a couple of months ago and suggested he give a shout-out to Aretha Frankenstein’s (a restaurant we covered HERE). We sat down at the bar and I ordered a drink called “The Skull Splitter.” It was pretty potent stuff and, in between watching the Chicago Blackhawks game (I’m not a sport’s fan but will say that hockey’s the most watchable of them and the fact that our team’s #1 sure didn’t hurt either) we started playing around with the bar’s unofficial mascot. Remember I mentioned that I’ve got a thing for diabolical toys and this one was a black, mechanical monstrosity with fangs that I had to get my hands on. After ordering our fourth round of drinks, I was bold enough to ask the bartender if they wouldn’t mind letting us handle it and they agreed. It ended up being a stripped down “Tickle me Elmo” doll; you know, the one that had parents beating each other up at department stores back in 1996? 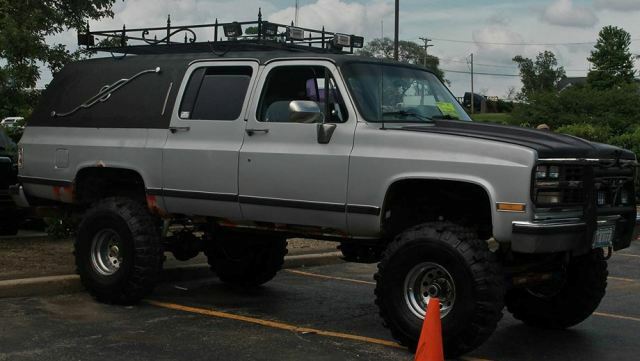 At the time I thought it was ludicrous but now, having witnessed its hidden potential, will likely smack someone around a local garage sale to ensure I get one. 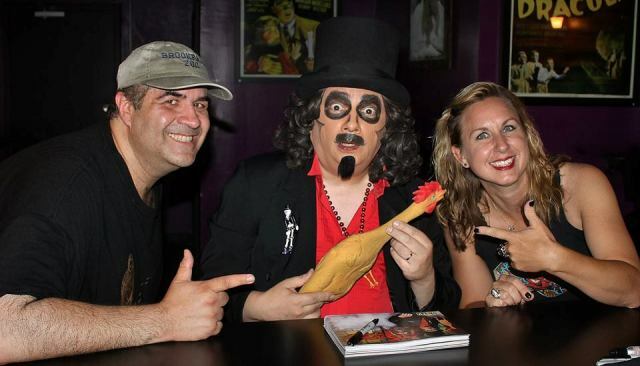 Coming Up…Svengoolie at the 2015 Chicago Comics & Entertainment Expo! This entry was posted in Convention & Expos, Stalking Svengoolie! 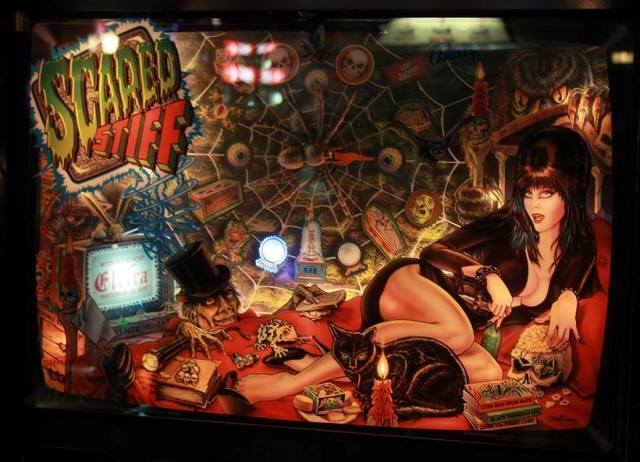 and tagged Blood Brood FX, Brauerhouse, Elvira: Mistress of the Dark, Hearse Show, KISS, Pinball Machines, Svengoolie. Bookmark the permalink. Thanks for this great article Dave. I was going to try to make it down there but other things came up. Maybe next year. Also I request Susan become a regular addition to your blog. Hahaha! I’ll pass on the message. Great article about a fantastic event. I’m glad to hear that, Dean! Hopefully I’ll see you at Flashback Weekend!